The Boca U14 Girls SYL team captured their first ever Super Y-League victory on Sunday while the Boca U16 boys upset DC United 4-1 at the Manchester Soccer Complex with a 4 goal effort by Joseph Sorrentino plus more in this week’s edition of the Boca Soccer Wire. 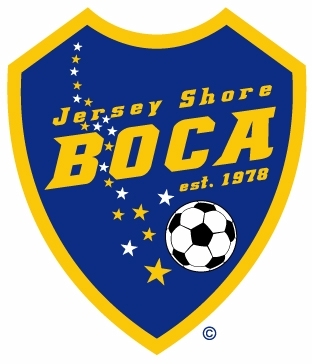 The Boca U23s defeated the Voorhees SC 3-2 during a Wednesday evening game at the Manchester Soccer Complex. Justin Fuccello (Brick) tallied the winning goal for Boca in the second half. On Saturday also in Manchester, Boca squared-off against perennial powerhouse FC Westchester from New York. Despite two goals from Kean University standout Sean Cahill (Whiting), Boca dropped the game 5-2. Cahill has now scored three goals in six games and is Boca’s leading scorer in the 2004 MSSL season so far. On Sunday, the U23s headed north to Montvale to face a strong World Class SC U23 side. Boca’s Goreleigh Willis (Wilmington, DE) tied the game 1-1 in the first half when he beat the World Class keeper to the near post on a cross served by Roberto Munoz (Barnegat). Boca allowed the 2nd and 3rd goals during the last 20 minutes of the match. “We need to play a little better defensively throughout the entire match and keep our composure in the back. We did not do that in our two weekend games” said Walt Konopka coach of the Boca U23s. “As I have mentioned before, MSSL is not a Sunday Tavern League. This is some great competition against very good clubs and collegiate players. It is an excellent summer environment for our U23 players. However, they have to be prepared to play each and every game for a full 90 minutes. We did some nice things so far but need to be more consistent” Konopka finished. Not in action this week. IMG Academy bound Joseph Sorrentino (Hamilton) tallied four goals for Coach Tom Gentz and the Boca U16s as they upset DC United 4-1 on Sunday at the Manchester Soccer Complex and improved to 2-2-0 in the SYL U16 Mid-Atlantic Division. Fellow Hamiltonians Stanley Touze and Varlee Koon each posted an assist in the win. Coach Tony Pezza and the Boca U14 Girls SYL team traveled north on Wednesday to face a strong side from the Parsippany SC. Although the Boca girls played well, they could not finish their opportunities. After leading 3-0 at the half, Parsippany took the match 4-1. On Sunday, the Boca girls switched direction and headed South to Maryland and squared-off against a powerful Baltimore Bays side. In a strong defensive match that held both sides to limited opportunities, the first half ended 0-0. The second stanza began as the first with the Boca girls fending-off numerous Bays attacks. With four minutes remaining in the match, Boca’s Noelle Eppleman, a Tuckerton native, ripped a shot from 15 yards out that sailed into the upper-left corner of the net past the Bays GK to give the Boca girls a 1-0 victory, the team’s first ever Super Y-League win. Goalkeepers Marisa Zayac and Shannon Watt, both from Jackson Township, combined for the shutout.